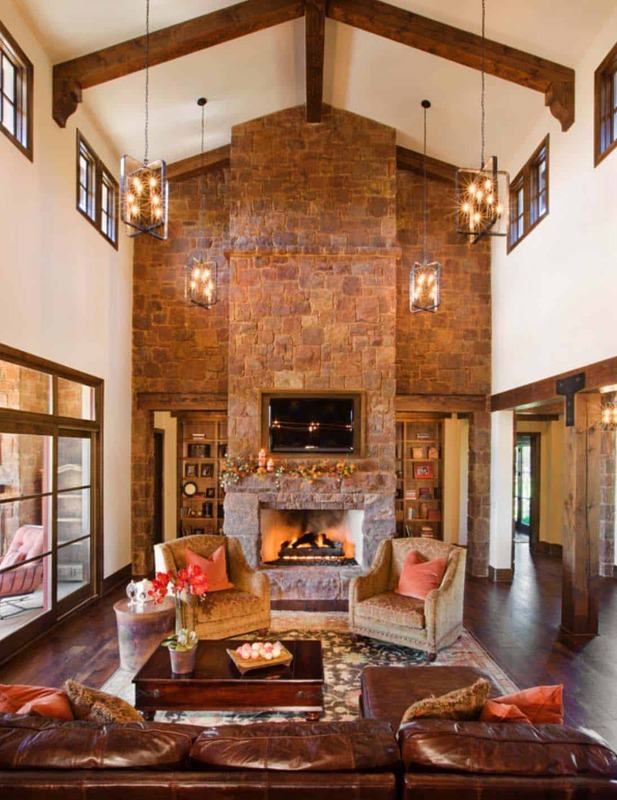 This gorgeous rustic hill country home was designed by Vanguard Studio and built by John Siemering Homes, located in Austin, Texas. 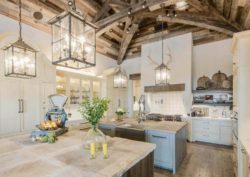 The design of this 5,412 square foot dwelling is the perfect example of how farmhouse charm and rich Old World elegance can perfectly blend together. 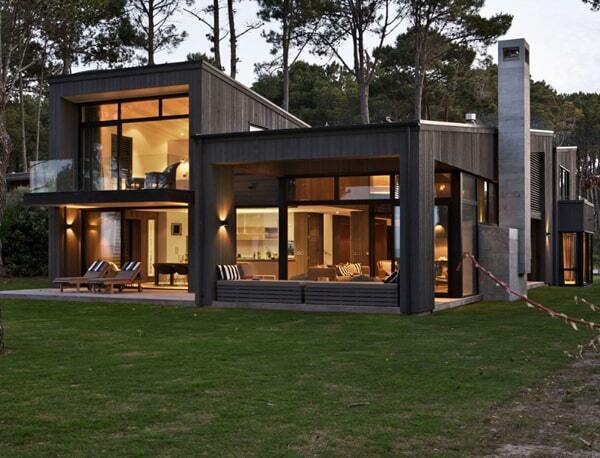 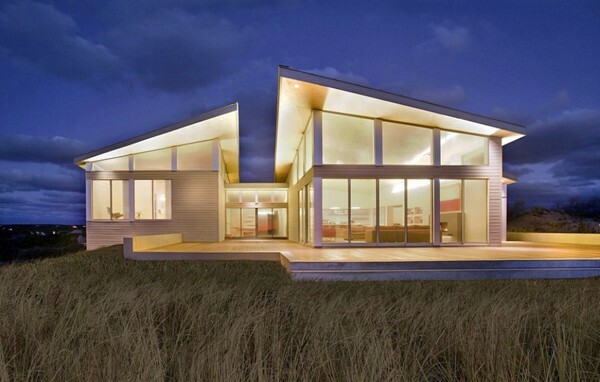 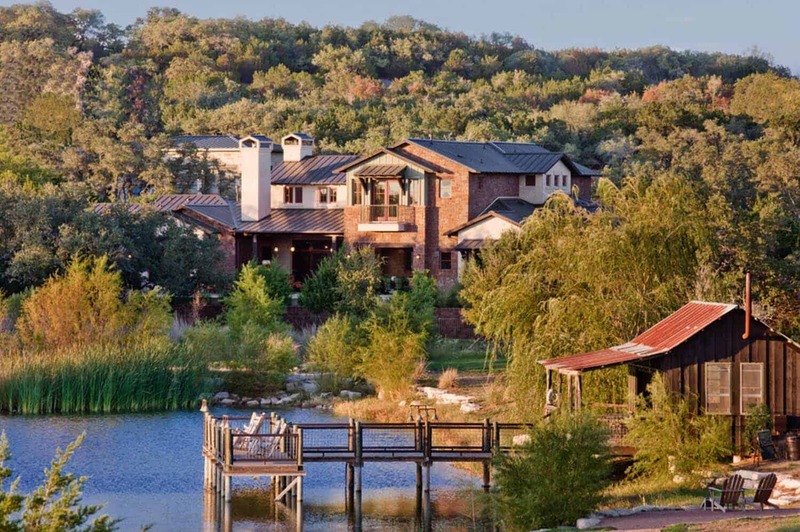 Inspired by the beauty of the natural surroundings, the home overlooks a fabulous fishing pond. 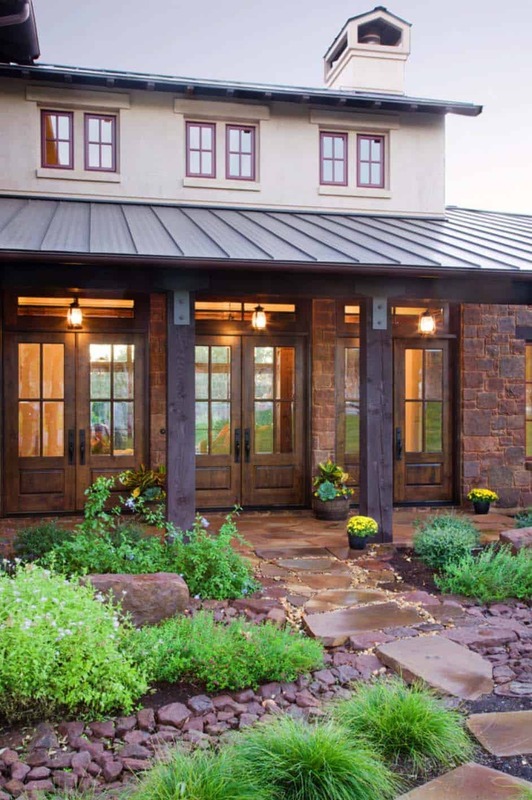 The exterior facade features a hand-hewn sandstone exterior with integrated stucco, exterior Douglas fir columns and beams and a metal roof. 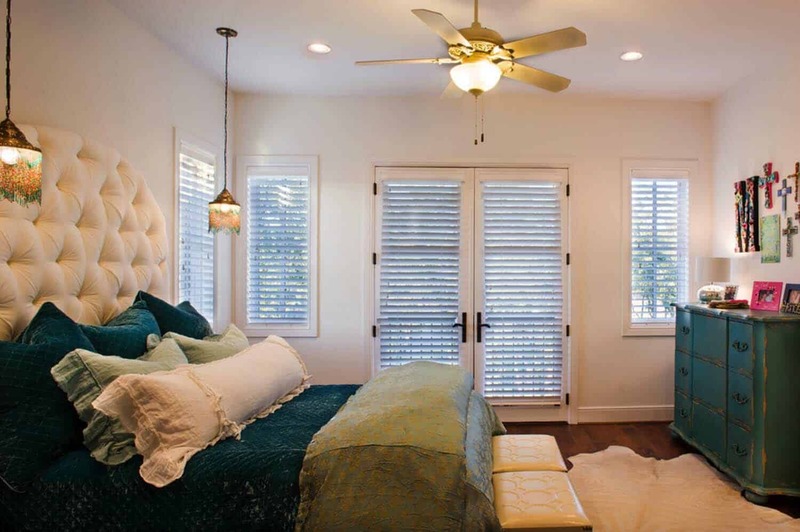 Three wood and glass french doors create a dramatic entry into the home. 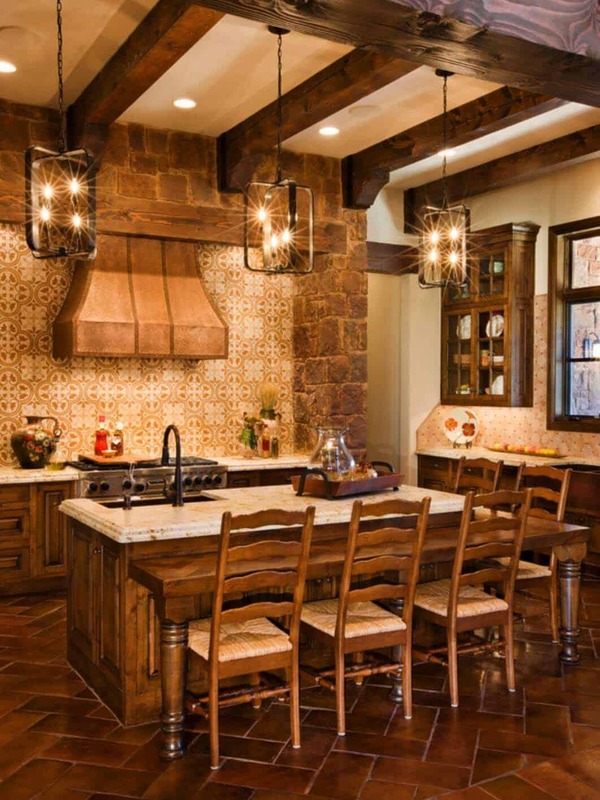 What We Love: This custom rustic Texas Hill Country home spares no attention to detail. 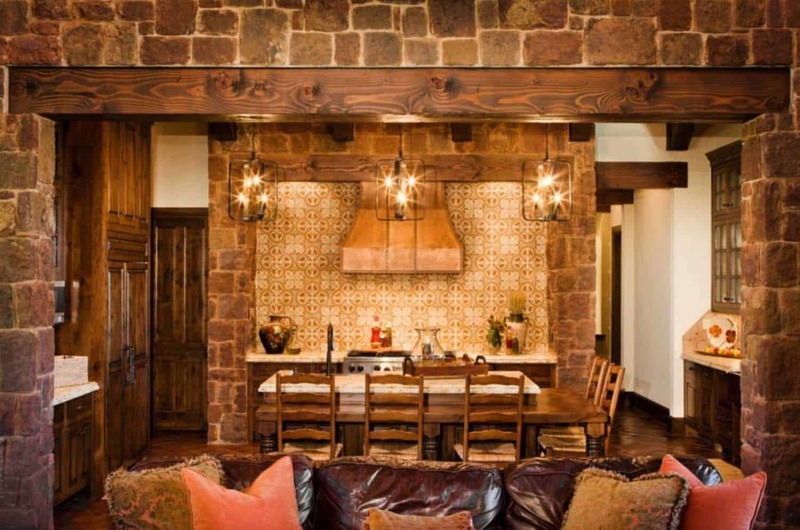 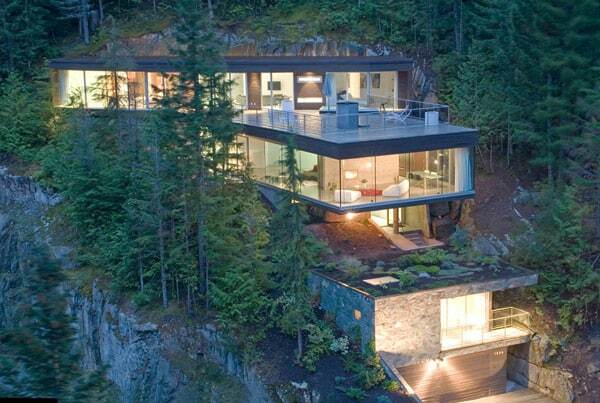 From slight eclectic Spanish/Moroccan influences to a deep woods cabin-esque retreat. 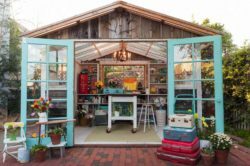 From fixtures to archways, shelving to landscaping. 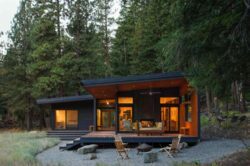 This exquisite dwelling offers a warm and inviting feel, truly a place to call home… Readers, what do you think, would this be your idea of the perfect dream home? 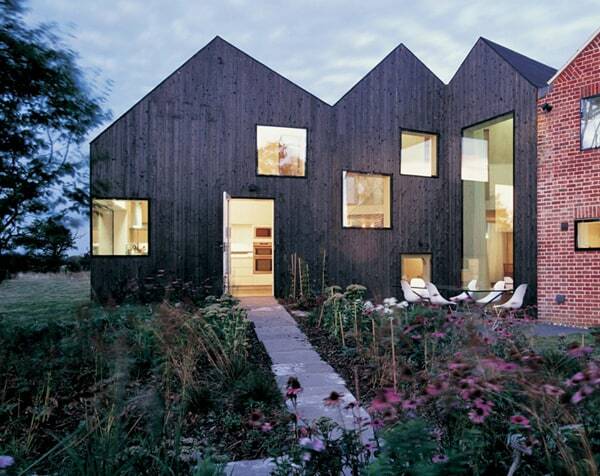 Please share your thoughts in the Comments below! 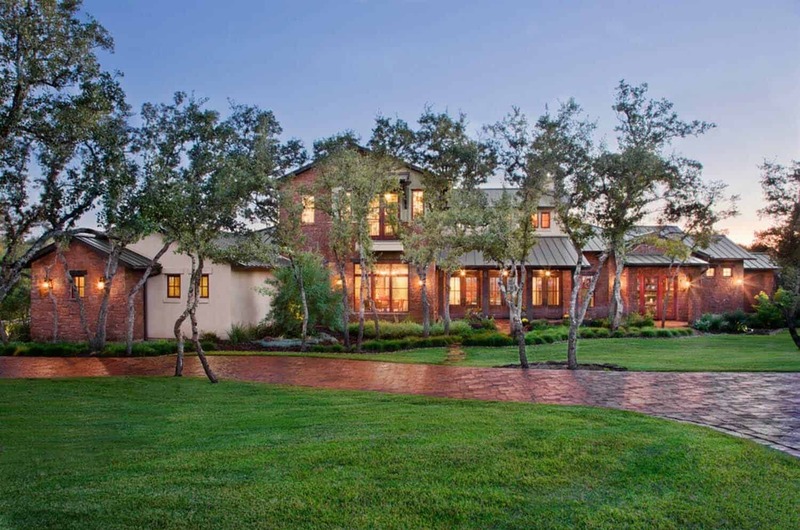 Note: Have a look at a couple of other fabulous home tours that we have featured here on One Kindesign from the architects of this home, Vanguard Studio: European farmhouse on a Texas hillside soaking in the views and Striking contemporary home with elegant features in Spanish Oaks, Texas. 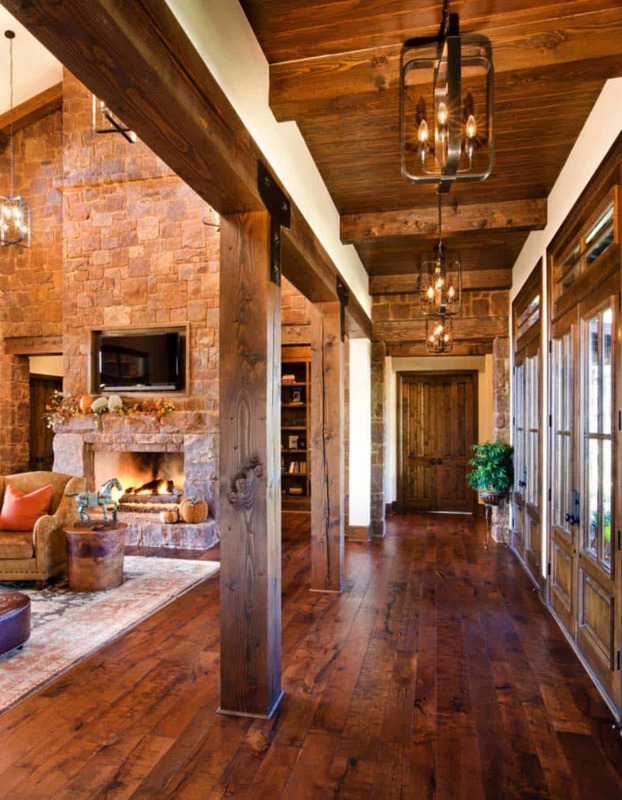 Above: The rustic interior of this gorgeous home immediately calms and relaxes with mesquite wood floors, knotty alder interior doors and exposed fir and steel beams and columns. 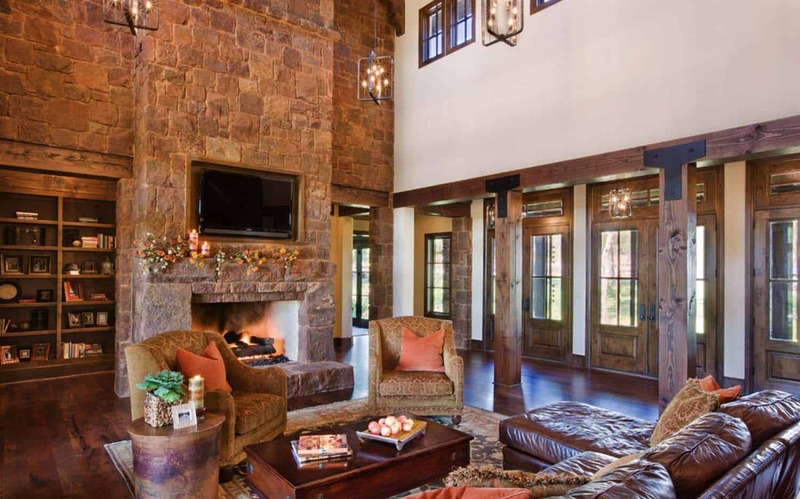 Above: A 60-inch masonry fireplace with hand-hewn sandstone extending across the entire wall is the focal point of the room. 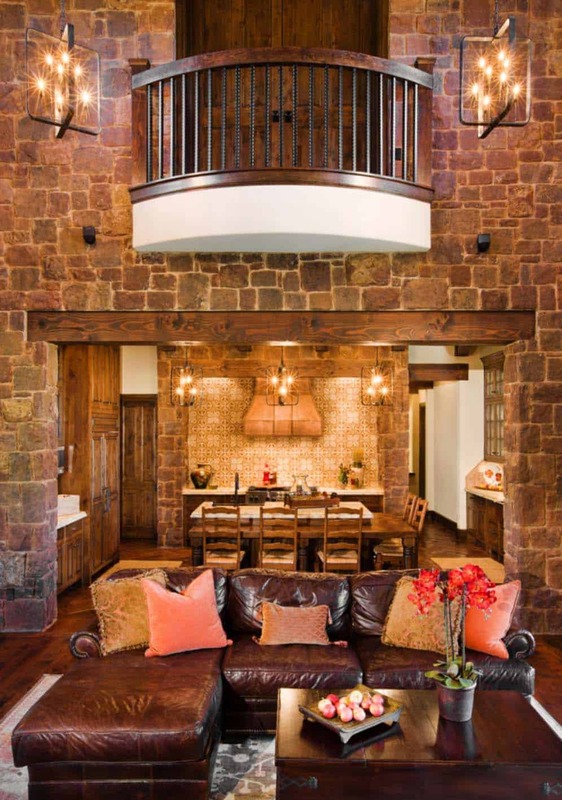 A curved interior balcony with wood railing overlooks the space. 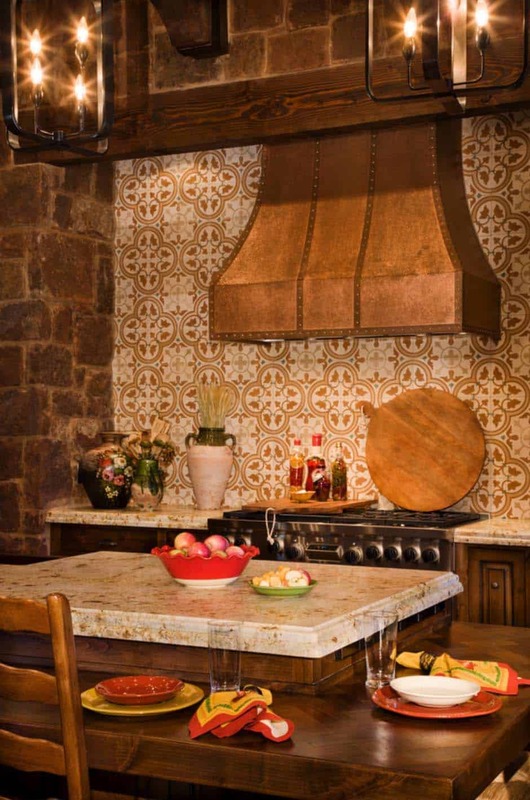 Above: The warm chef’s kitchen wows with a hand forged copper vent hood and imported Mexican clay tile backsplash and floor. 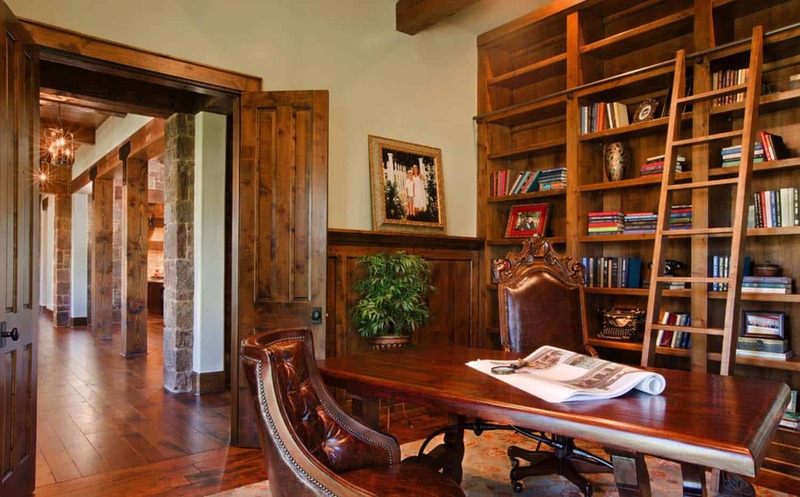 Above: A distinguished study with built-in bookcases, sliding library ladder and knotty alder wainscoting provides a quiet atmosphere in case relaxing gets too stressful. 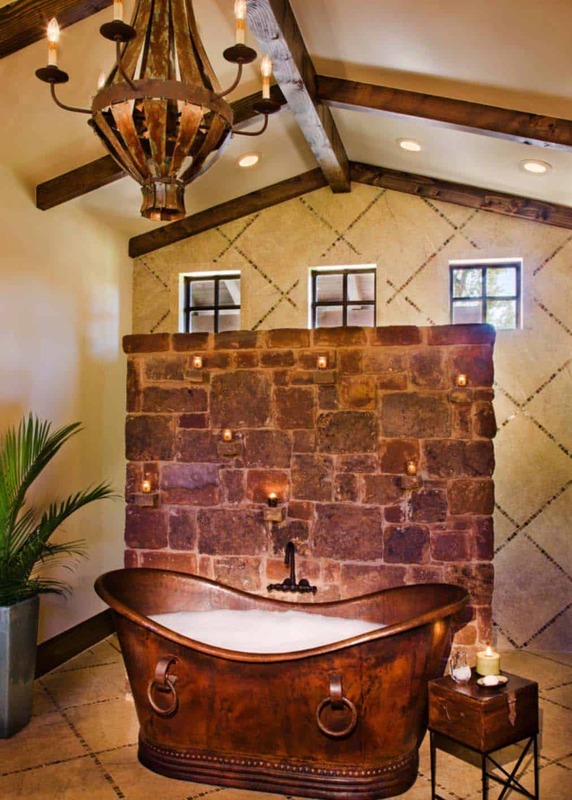 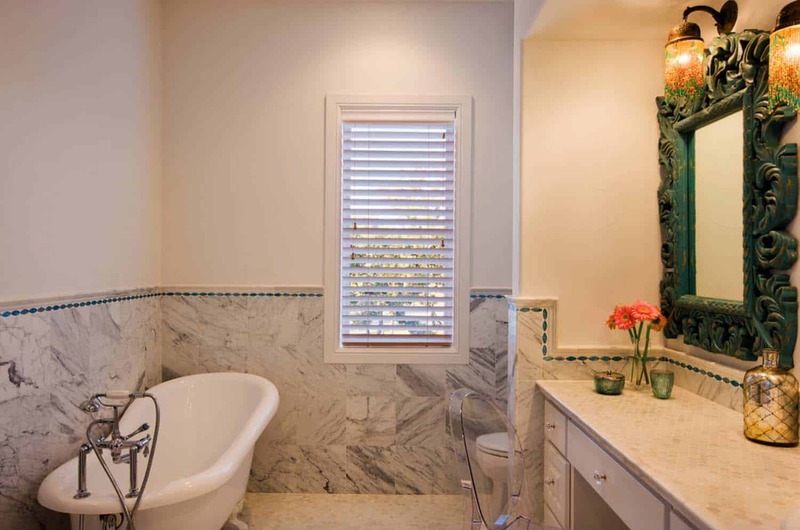 Above: Other notable features of this home includes a rustic old world feel master bath complete with a freestanding copper tub and hand stacked stone wall with niches for candle lighting. 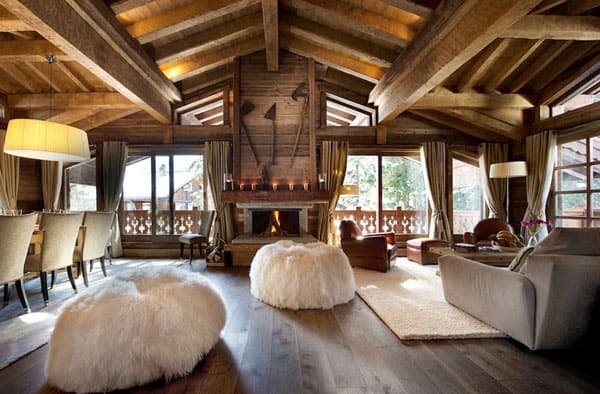 Above: The covered patio offers the finest in outdoor living with an outdoor fireplace, kitchen, grill and dining area. 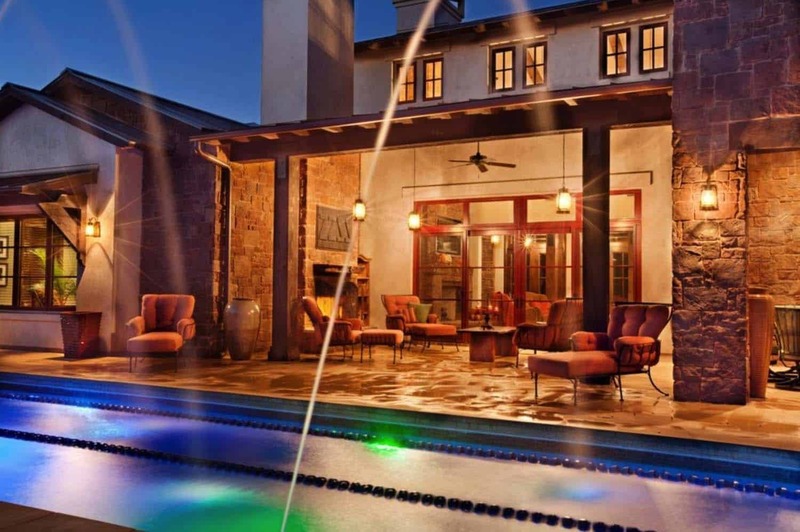 The home also boats a 75-foot lap pool for use by competitive swimmers.